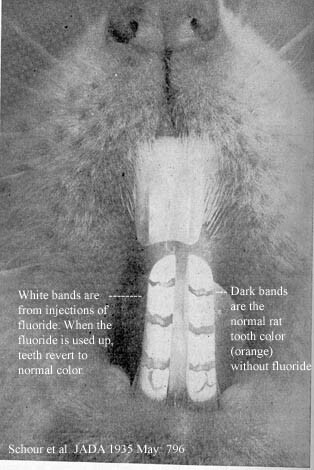 This is the most dramatic picture I have to show you the "white pigment" effect of fluoride. Human teeth are not affected nearly as much as these rat teeth, but the general idea is true. Here are a few details. There are 3 reasons the rat teeth show the effect so much. First, rat teeth are naturally darker (an orange color), so the white stands out in contrast. Second, the fluoride was given by injection, so there is an immediate jump in the blood concentration of fluoride. If the rats drink or eat the fluoride the effect is more mixed. Third, these rat teeth grow a little differently than other teeth. Most teeth grow in layers, and then erupt all at once. Instead, these rat teeth erupt constantly (and are worn down constantly), so are grown in daily increments on the end and pushed on up. That way each new bit of growth (and its coloration) is distinct, rather than lost in a layer as on our human teeth.